THR100H Dual, Modelling Guitar Amp Head from Yamaha in the THR series. Yamaha unveiled today two new 100W guitar modeling amp heads in the THR series, the single channel THR100H and THR100H-Dual. The new Yamaha THR100H-Dual is a true dual guitar amp, with identical control sections as well as two power sections, while the THR100H is a single channel model. Both compact heads offer 5 voices: Solid, Clean, Crunch, Lead and Modern, the latter being an US-modded version of the Lead, which has a more British sounds, such as the Crunch, while the Clean has a US tone and Solid sounds like a solid-state amp. You can also choose between 5 tube types to vary the color (6V6, EL84, KT88, 6L6GC and EL34) and two tube topologies (A or A/B). An effect section includes three types of boost, 4 reverbs, including a spring effect, a noise gate with three options, an IR-based speaker emulation as well as an effect loop. On the front panel are gain, master, bass, mid and treble EQ, presence, reverb and level knobs. 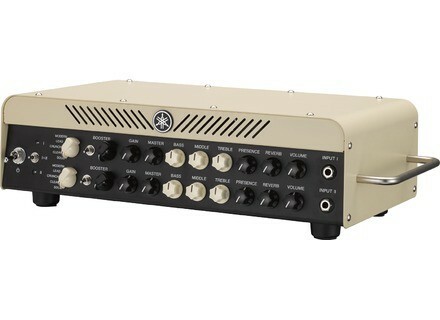 The Class D power section provides up to 100W at 8 or 16 Ohms (50W @ 4 Ohms and 50+50W in Dual Amp configuration) and Yamaha included a 24-bit / 44.1 kHz converter with a USB 2.0 interface to connect the amp to your computer. The connection panel also features a 1/8” headphone output, 1/4” effect loop, 1/4” speaker outputs, XLR line output and a 5-pin MIDI DIN to connect the provided footswitch. Discover the new THR100H and THR100H-Dual guitar amp heads at yamaha.com. Pre-Order the upcoming Henretta Heisenberg Henretta Engineering will launch in Octobre a new parallel boost and overdrive/distortion effect pedal for guitar that you can pre-order now. Rivera Venus Recording guitar amp head Rivera adds a new model to its Venus range of tube guitar amps with a version that allows for direct recording to a computer. Crazy Tube Circuits Splash upgraded to mkIII Crazy Tune Circuits updated its Splash reverb pedal to version mkIII, in order to add a new blue finish and three algorithms.